HOUSTON — J.J. Watt made another appearance on The Tonight Show, but this one was extra special because Jimmy Fallon revealed a big honor for Watt. The 2017 Sports Illustrated Sportsperson of the Year honoree raised over $37 million for Hurricane Harvey recovery. He spoke with Jimmy about those efforts as well as his injury and his stylish cane. But J.J. is not alone in the honor. The Astros’ José Altuve is also an honoree this year. “The 5' 6'' Altuve had his own contribution to Houston’s post-storm recovery. 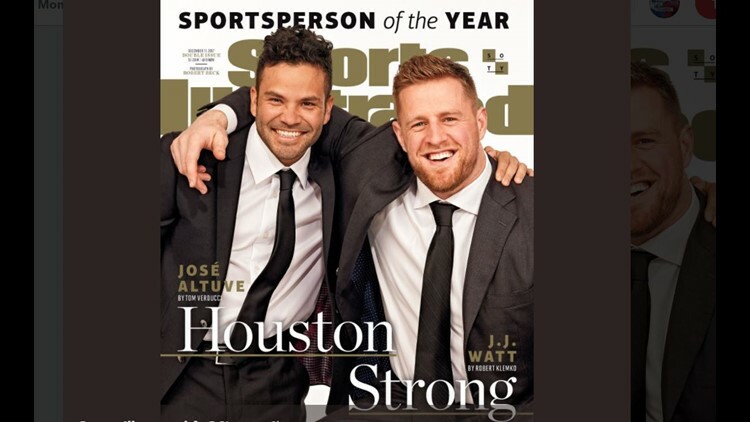 The personal journey of the Astros second baseman is an inspirational one, a classic tale of an underestimated athlete overcoming the longest of odds,” wrote Sports Illustrated. Read the article, tap here. Watch J.J.’s appearance on Fallon, tap here. The pair will accept the honor at SI’s Sportsperson of the Year Award Show on Dec. 5 at Barclays Center in New York. The show will be televised nationally for the first time, airing on NBCSN at 7 p.m. on Dec. 8 and on Univision Deportes Network at 7 p.m. on Dec. 9.